Balagopala Bhaskara Raju - meherbabatravels jimdo page! Bhaskara Raju was a man of many talents but will especially be remembered as the leader of a performance group that specialized in Burra Katha, a folk tradition of Andhra Pradesh in which storytelling is conveyed through song, music, and dance. Three players dressed as a Hindu, a Muslim, and a Christian participated in the performance, which took about four hours. 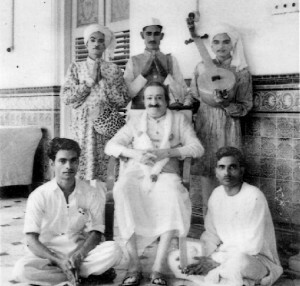 Bhaskara Raju would narrate Meher Baba’s life story, including Baba’s messages; Sathyam Parepalli, playing a string instrument, inserted Baba songs into the story from time to time; and Venkatacharyulu played the comic role of an innocent who asks “stupid” questions (“Why doesn’t he talk?”) in order to elicit answers to questions the audience would naturally have about Baba. Two other players — B. Sathyanarayana Raju (son of elder brother Ramabhadra Raju Balagopala) and Ramabhadra Raju (Bhaskara Raju’s father) — would accompany the entire performance on harmonium and tabla. In this way, Bhaskara Raju’s group spread Meher Baba’s name and message over 300 times in villages of Andhra Pradesh. Their first performance before Baba himself was in 1955 in Lower Meherabad. Subsequent performances for Baba took place in Guruprasad at Pune. Bhaskara Raju also pleased Baba by singing a Telegu song written by his elder brother, Ramabhadra Raju Balagopala, called “Namo Meher Baba,” which became a popular song for Baba-lovers from all parts of India. You can hear audio of the song online at the Hyderabad Baba center website. 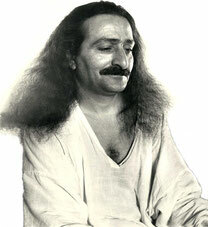 Scroll down to find “Namo Meher Baba.” If you click on “In English” in the opposite column, you will see the words in Telegu with English translation. 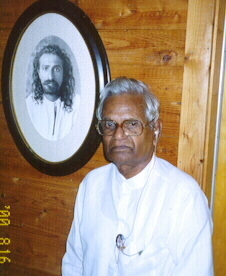 Meelan, a professional photographer in Pune, took a portrait of Baba with the Burra Katha group, made up of Bhaskara Raju; Parepalli Satyam; Kondapalli Venkatacharya; B. Sathyanarayana Raju (son of elder brother Ramabhadra Raju Balagopala) on harmonium; and Bhaskara Raju’s father, Ramabhadra Raju. 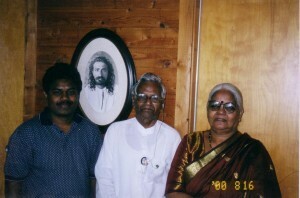 In 2002, Bhaskara Raju visited Meher Center in Myrtle Beach with his wife, Govindamma, and son Meher Isaa, daughter-in-law, and grandchildren. See Kendra’s Notebook blog for an article about his Baba story. 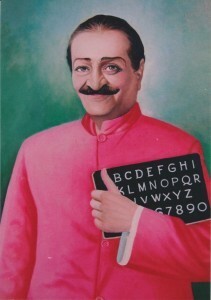 See below for one of Bhaskara Raju’s paintings of Meher baba.